Celebrating Abraham Lincoln&apos;s birthday – Wisconsin style. 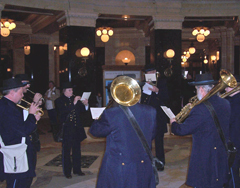 Members of Wisconsin&apos;s First Brigade Band perform at the Capitol, part of official ceremonies on the 200th anniversary of Abraham Lincoln&apos;s birth. Band Master John Condon says all instruments would have been familiar to Lincoln, and the band itself traces its roots back to the Civil War. Band members will also perform tonight, at the Governor&apos;s residence. Numerous other events around the state throughout this year will note the birth of the 16th president.